A holiday of sheer luxury awaits you at Augusta Lodge, situated within the secure Selborne Park Golf Estate. This family friendly house can sleep up to 10 guests with 5 spacious bedrooms. 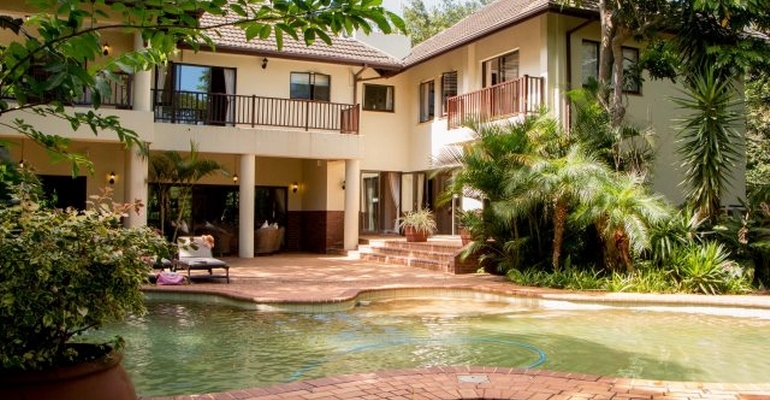 Built over 3 storeys on an expansive property, Augusta Lodge offers guests ample room for family and corporate functions, and with facilities such as an indoor sauna, outdoor jacuzzi, swimming pool with chaise lounges, children’s play area, billiards room with bar and TV, undercover built-in barbeque / braai area with outdoor furnishings, not to mention golfing on the Estate and access to the Private Beach Club; guests of all ages lack for no shortage of activities and entertainment when staying in this magnificent home. The house has a large open-plan lounge and dining area which adjoins onto the Billiard Room and leads out to the veranda making social events easy to cater for. The kitchen is beautifully designed and fully equipped with family in mind and has ample counter space and a “breakfast nook” with bay window offering gorgeous views. Guests staying at Augusta Lodge are invited to make use of the fabulous facilities at Selborne Park Golf Estate. Aside from the immaculate 18-hole golf course there is also a swimming pool, tennis courts, children’s play area and a restaurant & bar where delicious meals can be enjoyed daily.